Kakaokamkami is a Finnish trio of Russian immigrants who play their own brand of music that might be best described as 'noisy experimental' psychedelic. Their influences range from various forms of experimental, krautrock and electronic. Band's name doesn't really mean anything - it was stumbled upon by a couple of the members who were merely misspelling a couple of other words - just for grins and giggles. 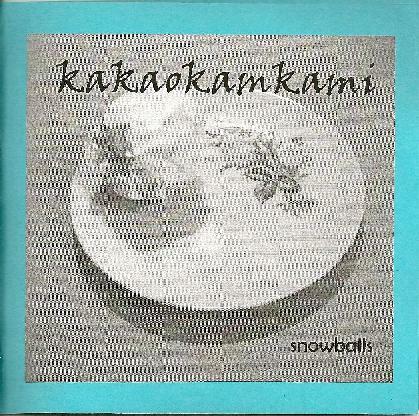 Snowballs is their first full-length CD, as they've got two earlier EP's out. Total of ten tracks with every other song dubbed as Untitled. Couple of the tunes here that I liked best were the nine-minute untitled cut no. 1 - that I thought sort of reminded me of maybe Pressurehed, Number 9, the somewhat droning Song About Hatti Vatti, Boot Boot which starts out with a cosmic intro - but then fully develops into a virtual noise fest and the well-played First Song Ever. Line-up: Sasha Kretova - keyboards, violin, chimes & voices, Dmitri Zherbin - bass, guitar & samplings and Alex Nuiga - drums, percussion and pads. Since I wasn't able to come up with even a few artists or bands who I could honestly compare this trio with, I'll say that Snowballs would likely appeal to fans of purely unconventional music. Be sure to check out their My Space, as I believe they've posted some songs + a live video or two of them performing at a music festival.